TrailRunner 3.1 has been picked as the editor’s choice on Softonic. I am not sure what it's worth, but mac.softpedia.com found TrailRunner to be free of any malicious code like spyware, viruses, trojans and backdoors. My first competition this year will be Sunday, March 21st for "Auf die Platte-fertig-los", Wiesbaden, Germany. As every year this is the first of a series of up-hill races I do. Roughly 8 km with 450 m of ascent. I wish all of you a successful season! [Updated] Grosser Testbericht über TrailRunner auf frosthelm.de, einem Online Magazin für Mountainbiker. Frosthelm sammelt Trails für Mountainbiker. Die Trails werden mit Action-Videos, Anfahrtsbeschreibung und GPS Daten vorgestellt. Gerade wegen der GPS Daten ist Frosthelm eine guter Fundus für TrailRunner aus dem MTB Bereich. As one might expect, the TrailRunner community is very international. Thanks to google, I can present you a Geo Map Overlay for TrailRunners, a graphical representation of the volume of visitors coming from locations around the world. The darkest spots indicate locations driving the most visitors to the TrailRunner website. Interestingly most of my visitors come from Europe, but why is that so? Americans, put your shoes on…! Lifehacker.com mentions TrailRunner in their feature article „The Best Tech Tools and Fitness Plans to Get in Shape“. If you're not keen on the web-based route, the Mac-only TrailRunner is an incredible desktop application that tackles many of the same features with a quick and very attractive interface. TrailRunner even integrates with Nike+ iPod, Google Earth, and your GPS (though MapMyRun does GPS, too). About: Lifehacker digs deep into the technoweb to publish totally life-altering tips and tricks for managing your life. Its readers are avid consumers of software programs, hardware gadgets, and “life hacks” that make their days more efficient, whether at work or at home. Updated over 24 times per weekday, Lifehacker is a bustling, authoritative hub for both pupils and professionals of productivity. „TrailRunner liefert nicht nur einen virtuellen Trainingspartner, sondern macht auch als GPS-Track-Editor für Amateur-Kartographen eine gute Figur“. I liked that they wrote me in advance to cross read the article and gave me a chance to make remarks. They even did send me a copy of the issue for my records. The issue will be out by Monday, January 19th. 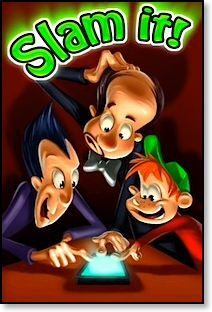 The other days I was sitting together with some friends and thought about a fun iPhone app. Well, as one thing came to another we decided use the accelerometer in the iPhone and iPod touch to detect if someone has slammed on the table and to point out who’s going to pay the next round. “Slam it!” is a fun way to draw sticks, have a shoot-out, find a random winner. Having a kids’ birthday and want to find a team captain? Need to determine who’s paying the next round? Who will be the designated driver? Which poor soul in your shared flat will do the dishes? Don’t just agree on it or, god forbid, command it – no, slam it! 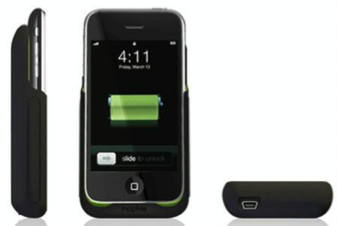 Put your iPhone or iPod touch on a table or desk. Gather the participants around your precious and have them select a playing field by placing a finger on the screen. (Explain to them this is the only circumstance under which you’ll let their greedy paws touch it!) Once everyone lifts their finger, the spinner will start. “Slam it!” can be played in two game modes (Protect Yourself and Last Player Wins) and comes with three themes to choose from. (German) Trailrunner wurde in der aktuellen COMPUTER BILD 24/08 im Rahmen eines Navigations-Vergleichstests kurz vorgestellt – auf der Seite 89 beim Thema “Freizeitnavigation” gibt es einen Screenshot. Auch genannt in dem Artikel ist iTrail für das iPhone. In the december 2006 issue of french SVM Mac magazine TrailRunner is being reviewed on page 98. It's a short description on what the application does and for whom it is useful. "TrailRunner se révèle un outil sophistiqué pour l'entraînement sportif e la préparation de parcours". June 2006 issue of UK MacFormat magazine published a two page how two get directions from your iPod. "Create maps and route plans, then transfer them to your iPod wit this ingenious piece of software". Pages 62 and 63. October 2006 issue of the german MacLife magazine wrote a News & Trends article about TralRunner and GPS Photo linker. The article is called "Rennende GPS-Fotografen" (running GPS photographers). Page 13. Frebruary 2006 issue of german c't magazine noted TrailRunner in its New for Mac section. Page 54 announces the new iPod Nano and below an Article about TrailRunner. "Mit TrailRunner kann man seine Laufstrecken planen". 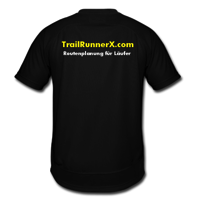 TrailRunner - One of the Best Mac-Software? Heise.de sucht für ein Themen-Special nach den besten Programmen für Mac OS X. Wer mithelfen möchte, dass der TrailRunner mit dabei ist, der kann über ein Online Formular bei Heise für den TrailRunner votieren. Würde mich freuen ! > TrailRunner im Heise Software Archiv dort dann auf die Bewertungsskala klicken (erfordert leider eine Registrierung). TrailRunner today got a special mention as "meilleure utilisation des technologies Apple" (Best usage of Apple technologies) in the MacGeneration Award 2006. This also is a big thank you to all contributors of feedback and new ideas. Even if we hardly speak the same languages.